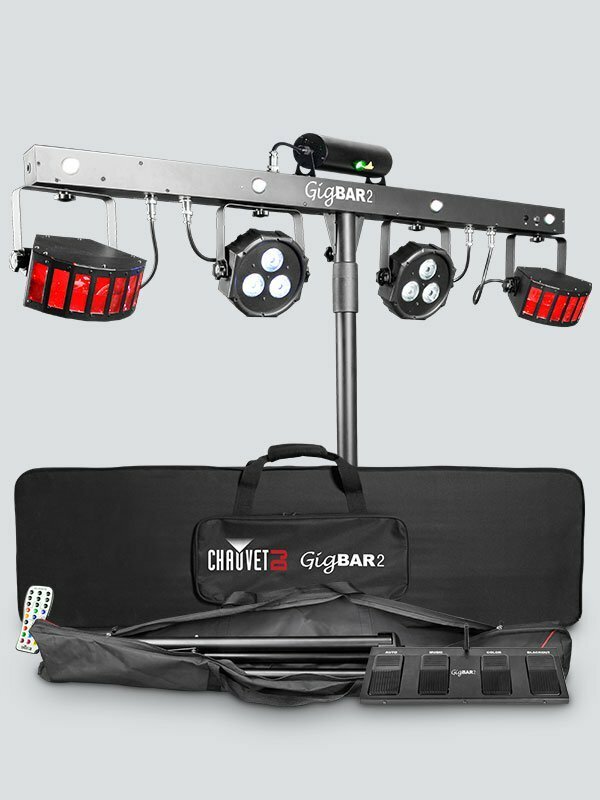 GigBAR 2 is the ultimate pack-n-go 4-in-1 lighting system including UV in its wash lights and strobes for better color mixing and effects. GigBAR 2 includes two LED Derby fixtures, LED wash lights, a laser, and 4 high-power, LED strobe lights all mounted on one bar. The unit features phenomenal built-in automated and sound-activated programs including all 4 effects. You can easily control the unit from the display, IRC-6 remote control, wireless foot switch or DMX to take your gig to a higher level. Master/slave multiple units and save time running cables and extension cords by power linking multiple units. Get in and get out quickly with the included tripod, wireless footswitch and FREE carry bags.